Mindful Eating Training for Yoga Instructors - Am I Hungry?Am I Hungry? Mindful eating—eating with intention and attention—provides a practical, universal approach to decision-making without restriction, deprivation, or guilt. Yoga is a wonderful complement to the practice of mindful eating because simply put, practicing yoga is the art of listening to yourself. Working with the body through yoga connects you with your spirit, while unraveling the physical, mental, and emotional knots that bind you and blind you from your true nature. Yoga enables us to explore mindfulness and change our perspective and relationship to food, appearance, and physical activity. It teaches us to appreciate what our bodies are capable of, to learn to listen to our bodies’ signals and honor them to best meet our needs. This training is for yoga instructors who want to offer mindful eating workshops combined with yoga classes to help their students embody the lessons. These two training options include the same content in different formats. Please fill out the form in the right side bar to download the information packet about online Mindful Eating and Yoga Training with more details and registration links. You may also want to watch this recorded webinar to learn the tremendous value of adding a mindful eating and yoga workshop to your offerings. 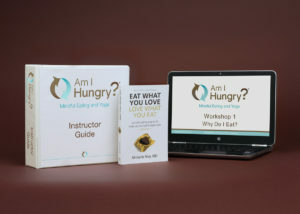 8 60-minute Mindful Eating Webinars facilitated by Am I Hungry? founder, Michelle May, M.D. 8 30-minute recorded discussions about yoga themes to embody the concepts. 1 hour business and marketing discussion. 16 recorded 60-minute yoga practices designed by Am I Hungry? Licensees, Jessie Dwiggins E-RYT and Dawn Hopkins E-RYT 500 to embody the concepts. There are two yoga classes for each of the mindful eating workshops; detailed written practice templates for each class are also included. Autographed copy of Eat What You Love, Love What You Eat (newly updated!). Am I Hungry? Mindful Eating and Yoga Instructor Guide, including detailed Mindful Eating Workshop outlines and Yoga Practice Templates. Eight PowerPoint slide decks (optional use; we encourage the use of flipcharts in a studio setting). Continuing education credits and MUCH more! Please fill out the form in the right side bar to download the detailed information packet. What do other health and wellness professionals say about Am I Hungry? training? Can I earn continuing education credits for this training?